In this post, we’re going to give you some suggestions for our favourite day trips from Inverness – Scotland’s most northernmost city. Inverness is often referred to as the capital of the highlands, and has multiple attractions on its doorstep, from Loch Ness through to the Black Isle, numerous castles and various whisky distilleries. There’s also lots to see in Inverness too so don’t forget to do some exploring in the city itself! Inverness is an easy city to get to, with multiple transport options, and plenty of places to stay. Combine that with all the nearby attraction, and we think Inverness makes for an excellent base for exploring some of the highlights of northern Scotland and the highlands region in particular. 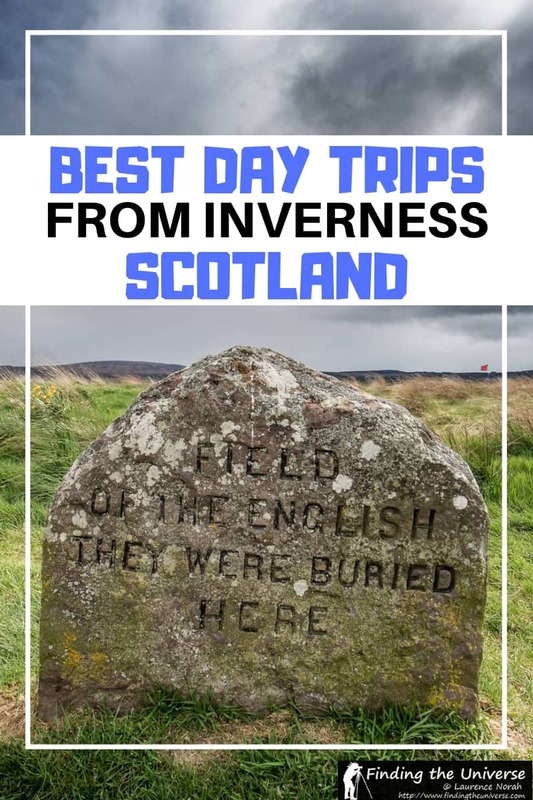 The trips in this post are all achievable in a day from Inverness, and we think they sum up some of the best that this area has to offer. As well as listing the trips themselves, we also give you options for how to do the trips, from driving yourself through to public transport and day tours, ideas for where to stay in Inverness and some other practicalities for your visit. There are a lot of options for exploring around the region around the city, some attractions which are close by and easy to get to by public transport, others are a little further away, and may require either a tour or a car. We’ve picked our favourites, which are a combination of the two, to give you lots of options for your stay. One of Scotland’s most famous attractions is Loch Ness. Inverness actually sits on the River Ness, which is fed from this well known body of water, and the Loch itself is just eight miles from the city. Loch Ness is famous for a number of reasons, top of which is of course the Loch Ness monster, affectionately known as Nessie. Nessie stands as one of the great mysteries (or hoaxes) of the 20th century, and many visitors to the Loch are hopeful of a sighting. Of course, Loch Ness is notable for more than just Nessie. It’s the largest loch by volume in the British Isles – there’s actually more freshwater in Loch Ness than there is is all the lakes in England and Wales combined! As well as spotting Nessie, highlights of a visit to Loch Ness include taking a boat ride on Loch Ness, visiting the ruins of Uruquart Castle, Loch Ness Centre & Exhibition, the Falls of Foyers, and visiting some of the pretty villages along the loch shore. These include Drumnadrochit (home to the Loch Ness Centre & Exhibition) and Fort Augustus, where you can watch boats going up and down the impressive seven stage locks that link Loch Ness with the Caledonian Canal. We visited Loch Ness on a day trip from Inverness with Rabbie’s Tours. This was a full day experience that included a stop to see Highland Cows, the option for a Loch Ness cruise and a visit to Uruquart Castle, a visit to Foynes waterfall, and time in both Invermoriston and Fort Augustus. We also spent time on the south side of the Loch, which is less busy, as well as on some quieter backroads with wonderful highland views. 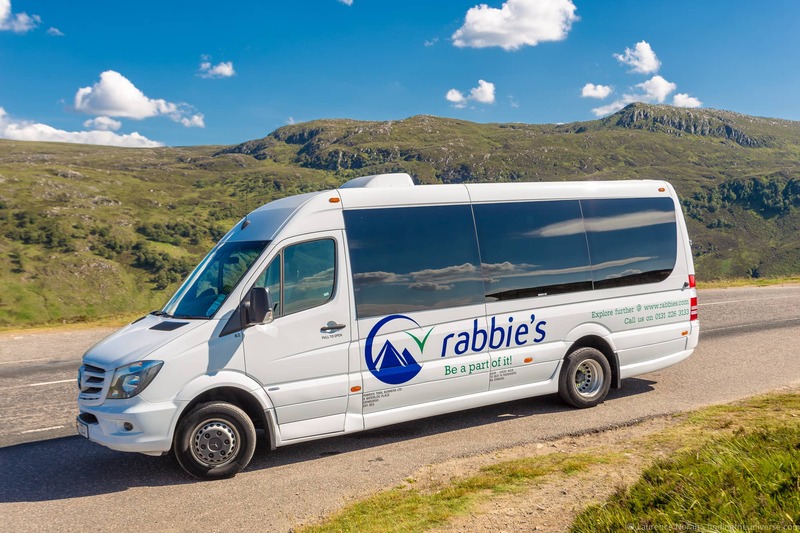 This was a really nice day out, and we always enjoy taking tours with Rabbie’s – there guides are friendly and knowledgeable, and their modern Mercedes buses are really comfortable. Of course, you can also visit Loch Ness under your own steam. If you have your own car car, or hire one, it’s just a fifteen minute drive from Inverness to Loch Ness, and you can then explore the attractions at your leisure. Alternatively, you can also visit Loch Ness by public transport. Buses run from Inverness out to Fort Augustus, with stops at the major attractions along the way. This will take a fair bit of planning, and you’ll want to be sure you have a copy of the timetable on you so you are able to get back to the city once you are done sight-seeing, as it’s a bit of a walk if you miss the bus. Inverness also has a Hop on Hop off bus, which takes you to where the boat cruises for Loch Ness depart from. 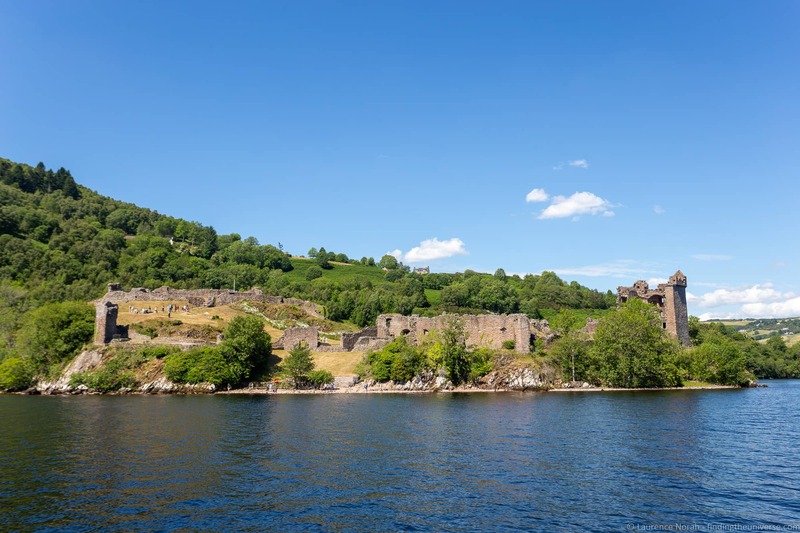 From here you can take a cruise on Loch Ness, with stops including Uruquart Castle. The easiest way is definitely to book a tour with an operator like Rabbie’s. We’ve taken a lot of their tours, and have always enjoyed ourselves, and our Inverness day trip to Loch Ness was no different. See prices and check availability here. The Cairngorms is Scotland’s second national park, and is also the largest national park in the UK. It’s found around 20 miles to the south of Inverness, meaning that it is definitely visitable on a day trip, but the sheer size of the park means that you won’t be able to see absolutely everything in a day. There is a lot that you can see in the Cairngorms in a day though. The village of Carrbridge is the closest attraction to the Cairngorms, and this is home to artists studios and a beautiful old stone bridge. Just south from here is the town of Aviemore, which has numerous shops and eateries, and is also the home of the Strathspey Railyway, which operates steam trains from Aviemore to Broomhill and back. Both Aviemore and Carrbridge are accessible by rail from Inverness. 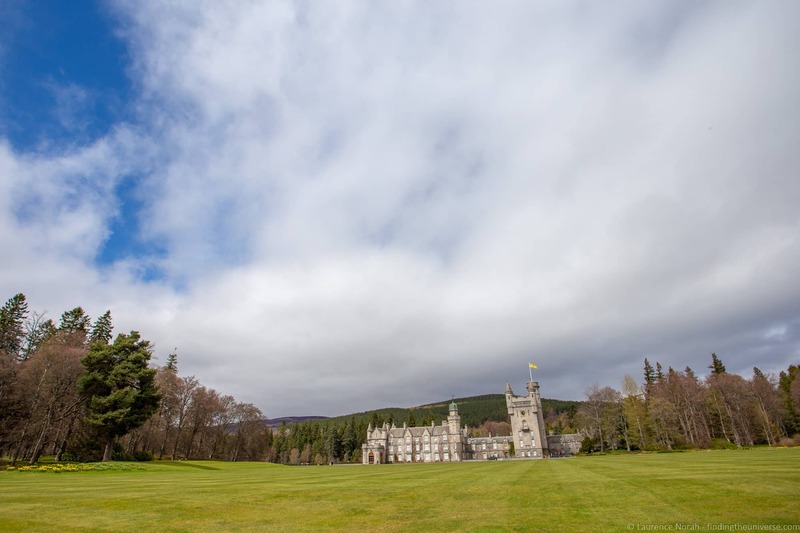 Going deeper into the park, you’ll find a number of Scotland’s ski resorts, excellent hiking and wildlife viewing opportunities, Balmoral Castle – the summer escape of the British royal family – and numerous world famous whisky distilleries, including Glenfiddich and Dalwhinnie. There’s lots more to do in the Cairngorms of course, from staying in castles to seeing reindeer to driving the snow roads, and we have a full guide to visiting the Cairngorms here. Getting to the Cairngorms from Inverness is easy if you are driving, although be aware that the roads in the park are quite winding, so driving distances are increased. Also, if you’re visiting in winter, be aware snow and ice can affect the roads, particularly in the higher parts of the park. Public transport also serves the park, and in particular there are good rail connections to Carrbridge and Aviemore, although if you’re visiting for only a day, public transport will not let you experience a great deal of the park. So if you plan to go via bus or train, you’ll want to plan out your trip in advance. It’s also possible to do a tour from Inverness, this tour for example includes Carrbridge, Aviemore, a ruined castle, and a visit to the Glenfiddich Distillery. The Battle of Culloden on the 16th April 1746 was the last battle fought on the British mainland. On one side were the Jacobites, supporters of Charles Edward Stuart, also known as Bonnie Prince Charlie. Their goal was to restore the Catholic house of Stuart to the British throne. They fought British government forces, loyal to George the II of the House of Hanover, under the command of the Duke of Cumberland, who had the goal of putting down the uprising and keeping a Protestant ruler on the throne of England. The battle was won decisively in favour of the British government, and whilst both sides suffered losses, the Jacobite suffered losses of a much greater magnitude – at least 1,500 dead, compared to 50 on the government side. Charles Stuart fled the country, and spent the rest of his days in France. This was the end of the Jacobite rebellion. Following their crushing defeat, tough policies were enforced in the Scottish Highlands in order to ensure such an uprising wouldn’t happen again. This outlawing of various cultural practices, including prohibiting swords and wearing of tartan or kilts, effectively worked to end the warrior clan system that had been a way of life in the Highlands for centuries. So that was the history. Today, Culloden Battlefield stands in memorial to those who lost their lives on both sides, as well as to tell the story of the battle, the reasons why it occurred, and the events leading up to and after it. There’s an excellent on-site visitor center run by the National Trust for Scotland, and you can also visit and explore the battlefield itself. Entry is free to National Trust members, otherwise you’ll need to pay an entry fee, which you can either pay on arrival, or book online in advance. Culloden Battlefield is around five miles outside Inverness, so if you have your own car it’s a short drive. This is a good option as there are a number of other attractions nearby, including the Clava Cairns. Culloden Battlefield can also be reached relatively easily by public transport from Inverness – it takes just over half an hour and buses run quite regularly throughout the day. Finally, there are some tours that visit Culloden departing from Inverness, although they include Culloden as part of a full day, so you’d only want to do it this way if they include other attractions you are interested in seeing. As an example, we found this small group tour, which as well as Culloden, also includes Loch Ness, the Black Isle, Clava Cairns and the Glen Ord whisky distillery, letting you see many of the highlights around Inverness in one day. Just north of Inverness you’ll find the Black Isle, a large peninsula that is in fact neither black, nor an island. The name comes from the fact that it is largely surrounded by two large firths, the Moray Firth and the Cromarty Firth, and the colour is thought to be because it was once heavily forested, giving it a dark appearance. Naming aside, the Black Isle makes for an excellent day trip from Inverness. On the tip of the peninsula is the town of Cromarty, where you can take wildlife viewing tours to spot dolphins and seabirds. Chanonry Point, on the south east side of the peninsula is one of the best places in Britain to spot dolphins from the shore – they come here to feed on the salmon. 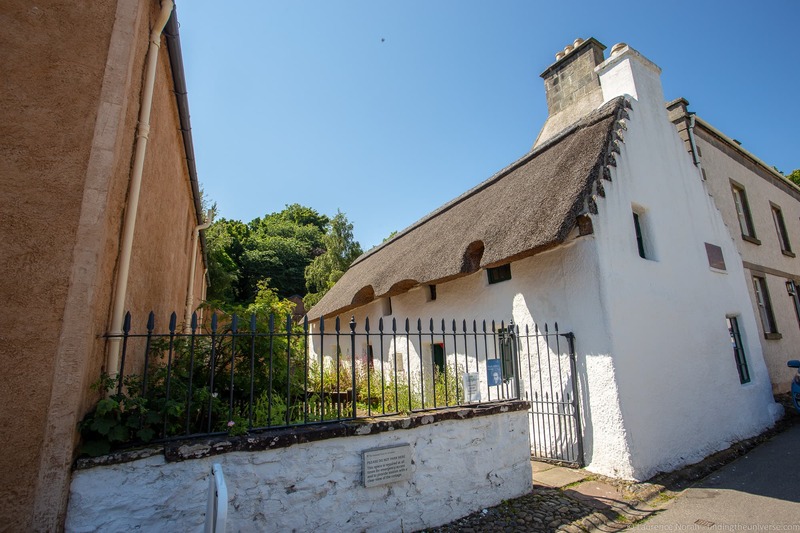 In Cromarty, you can also visit the home of Hugh Miller, a renowned 19th century geologist. The Black Isle is also home to the Black Isle Brewery, who brew excellent Scottish beer, and you can tour the brewery and sample their products. There’s lots more to do on the Black Isle, including visiting waterfalls, ruined cathedrals, and leaning about Pictish history – check out our full guide to what to do on the Black Isle for more information. We’ve visited the Black Isle a number of times, including as part of a North Coast 500 road trip, and also as a guided day trip with tour operator Rabbie’s out of Inverness. The tour we took with Rabbie’s (check prices and availability here) covered our favourite spots on the island, including Cromarty and the Black Isle Brewery, and included the option to take a wildlife watching cruise. It’s also possible to get to the Black Isle by public transport, with buses running from Inverness to Cromarty via Fortrose, so you can see some of the highlights of the island this way too. However, some of the sights, like the Black Isle Brewery, would be harder to get to this way. When you think of Scotland, a few things likely come to mind. These will likely include bagpipes, kilts, haggis and fantastic scenery. I’d also wager that Scotch Whisky would be high on your list of things you associate with Scotland! Scotland is home to over 120 active distilleries, which are found all across the country. For whisky production, Scotland is split into five major regions, with Speyside being one of them. Each region tends to have a fairly distinct flavour profile. For example, Speyside whiskies are characterised either by their light and grassy notes, or for being richer and sweeter. Speyside takes up a corner of the Highlands to the east of Inverness, and despite being relatively small in area, is home to the largest number of distilleries in Scotland. The name comes from the River Spey, which runs through the area, and is the source of the water for many of the distilleries here. Whiskies made in Speyside include Glenfiddich, The Glenlivet, Benromach, and Macallan – to name but a few! Visiting whisky distilleries in Scotland is often high up on the list of visitors to-do lists when they come to Scotland, and many distilleries offer tours and tastings, where you can learn all about the whisky making process, and of course sample some yourself. A whisky tour is definitely something we suggest that you consider doing as part of a tour. Whilst you can of course drive yourself, the drink driving laws in Scotland are very strict, so the designated driver won’t be able to really take advantage of the tastings, which is one of the main reasons to visit distilleries. We’d also suggest skipping public transport for this – most distilleries aren’t located in easily accessible locations. 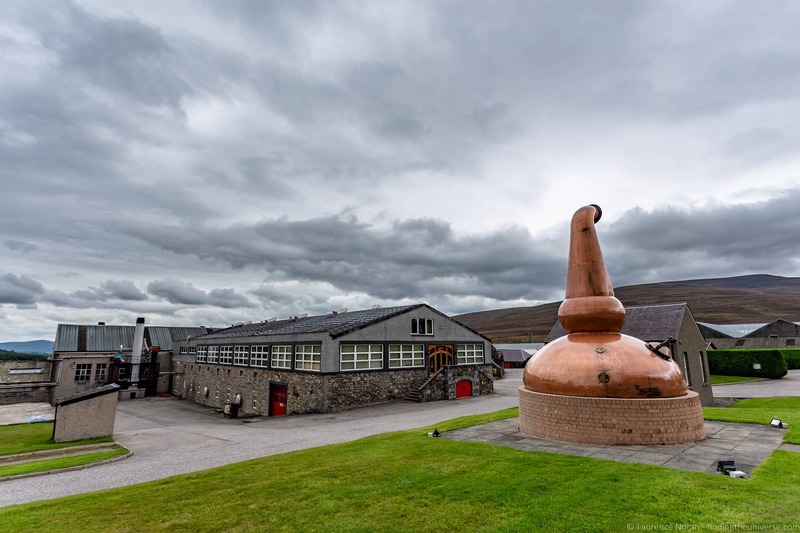 Instead, from Inverness, we’d advise taking a tour like this one, which includes stops at some of the more famous distilleries, but also other highlights of the region, as you probably don’t want to spend all day just drinking whisky. Following the battle of Culloden, mentioned above, the British government set about building military outposts to ensure control of the highland areas. One of the most impressive of these, which is still in active use as an army barracks, is Fort George. 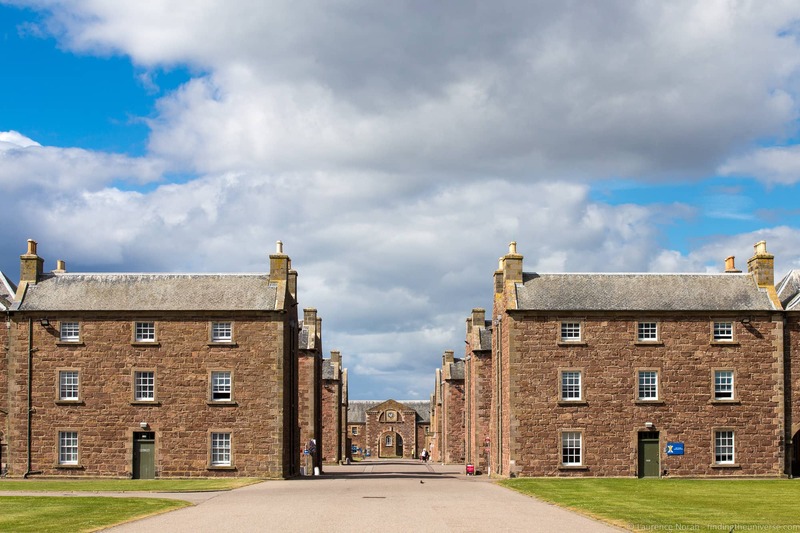 Fort George is 11 miles east of Inverness on the Moray Firth, with a commanding position overlooking the Black Isle and the surrounding countryside. It’s huge, with walls up to twelve meters in height surrounding the internal buildings, and looks ready to stave off any attack. As it turned out, Fort George never actually saw action. Although, when you visit, you’ll understand why any potential attacker might have been put off attacking, given the sheer scale of the place. The good news is that despite this being an active army facility, it’s also open to the public for tours, and you can easily spend two or three hours here. If you’re travelling in your own car, this would be a good day trip to do as part of a trip to Culloden Battlefield, Cawdor Castle and the Clava Cairns. We’d also suggest you continue heading east along the coast here, and take in the towns of Elgin and Nairn. Elgin is notable particularly for the ruins of Elgin Cathedral, which started to fall into disrepair in 1568 after the lead was removed from its roof. Today you can visit and wander the ruins of the cathedral, which are truly spectacular. We also can recommend Elgin museum. If you do this, you might consider investing in a Historic Scotland explorer pass, as both Fort George and Elgin Cathedral are managed by Historic Scotland, as are other attractions in the Inverness area, such as Uruquart Castle. Finally, you might want to pop along to Nairn to finish off your day out. This has a beautiful beach, lovely walks, a variety of restaurants, and two championship golf courses! For this day trip, you’ll likely want your own transport. You can get a bus out to Ardersier, which is the closest town to Fort George, and it’s around a half hour walk from here to the Fort. You can also get buses directly to Elgin (around an hour) and Nairn (around 30 minutes) if you wish. We’re not aware of any tours that run from Inverness to Fort George, or that continue on to Elgin or Nairn. One of Scotland’s most fairytale-like Highland castles is Dunrobin Castle, around 50 miles north of Inverness on Scotland’s east coast. This is one of our highlights of the North Coast 500 route, but you can also visit here as a day trip, as well as take in some of the other attractions along the route. Dunrobin Castle dates from the 15th century, but much of what is visible today is from the early 19th century, which a style very similar to French castles. The castle has 189 rooms, meaning it’s the largest castle in the northern Highlands, and you can take a self-guided tour of a number of these. There are also beautiful landscaped gardens, and a Victorian era museum which is still arranged in the same was it was when it was set up, which means a lot of exhibits in a relatively small space, most of which are of the stuffed animal variety. It’s definitely an eye opening experience as to the tastes of the Victorians! Another popular reason to visit Dunrobin Castle is the falconry display. These are often rated as the best attraction on site, so do make sure your visit coincides with when these are running. On your way to or from Dunrobin we can also recommend a stop at the town of Dornoch. This is home to one of the world’s most famous golf clubs, The Royal Dornoch, with golfers coming from around the world to play here. 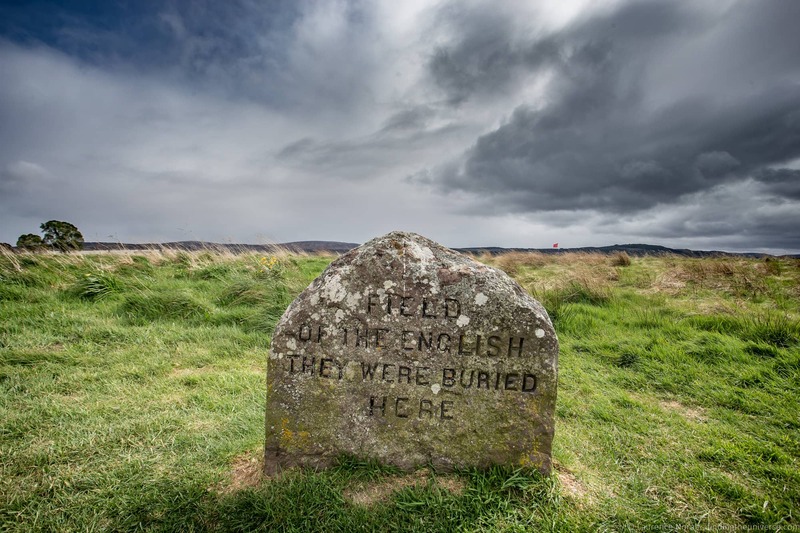 There’s also an old castle hotel, a beautiful cathedral, a town heritage museum, as well as a marker which shows the spot where the last alleged witch in Scotland was condemned to death in 1727. 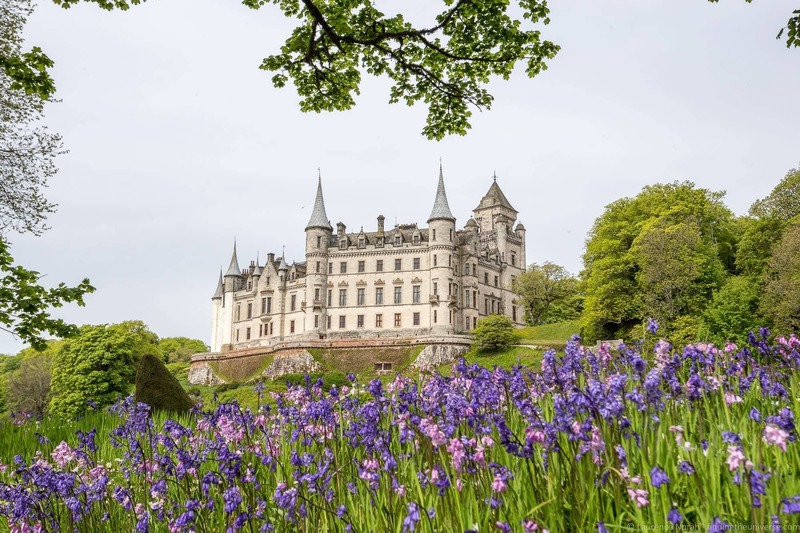 The easiest way to get from Inverness to Dunrobin Castle and Dornoch is to drive yourself, which will let you stop off at a variety of the attractions on the way and go at your own pace. You can also take the bus from Inverness, which takes around an hour and a half, or you can take the train, which will take a couple of hours. The castle has both a train station and bus stop within a few minutes walk, so this is certainly an option if you don’t want to take a tour or drive yourself. There are not too many tours that include Dunrobin Castle as a day trip from Inverness. We did some research, and the only one we found was this one. But if you have more time you might consider a longer tour, such as this three day North Coast 500 tour with Rabbie’s. 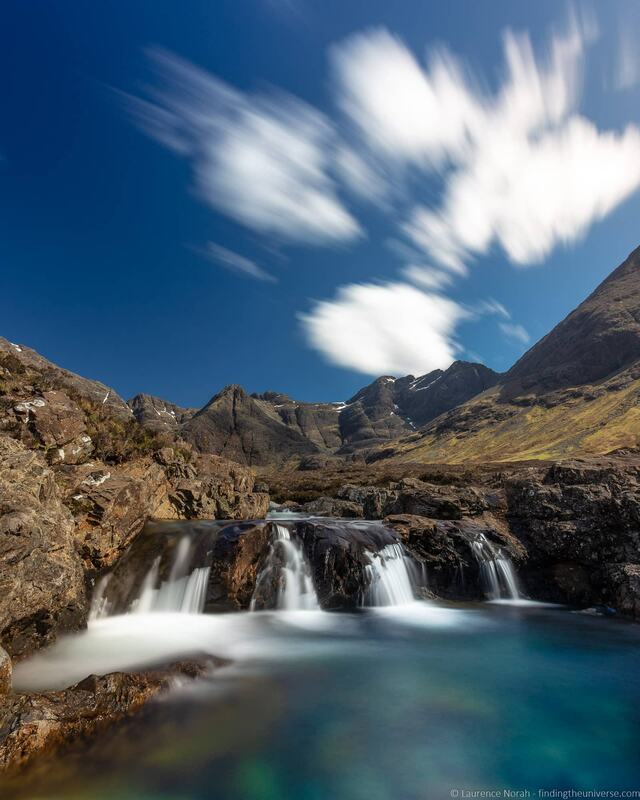 The Isle of Skye is one of our favourite photography locations in Scotland, and is a very popular spot to visit. It has fantastic landscapes, cute villages, interesting history, and even dinosaur footprints on the beaches! 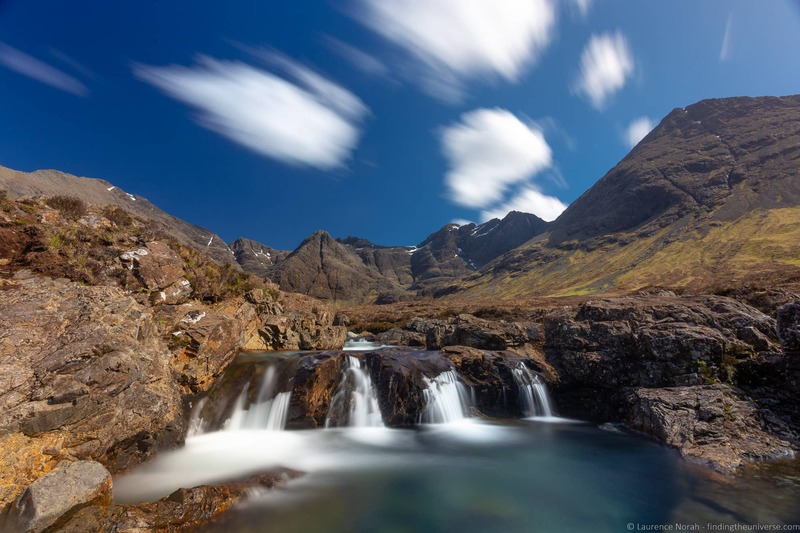 Whilst we highly recommend spending more time here than just a day (essential if you want to escape the crowds on Skye), we understand that not everyone is going to have lots of time to play with on their Scotland trip, and as such, we wanted to include a visit to Skye as an option for a day trip from Inverness. Of course, this will be a long trip with a fair amount of driving. Skye is off Scotland’s west coast, and Inverness in on the east coast. So you have to cross Scotland first. Skye is also quite big, and the major sights are spread out across the island. So a day trip is going to involve a lot of driving. This said, of all the cities in Scotland, Inverness is the best one to do a day trip to Skye. It’s around a two hour drive from Inverness to reach the island. This is definitely a day trip that we’d suggest a tour would make sense for. It’s a lot of driving, so you might as well let someone else do it, and let you enjoy the Scottish scenery going by. The tour we recommend is Rabbie’s day trip to Skye, which covers most of the highlights of the island, and also stops at Eilean Donan Castle (see below). You can also drive yourself, but if you’re going to do this, we really urge you to spend the night on the island to get the most out of your trip. 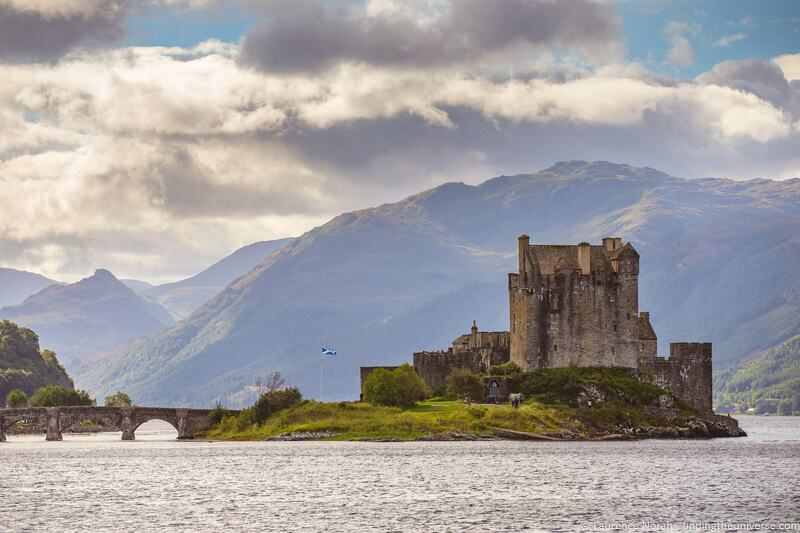 As Scotland’s most photographed castle, Eilean Donan is certainly a popular stop for visitors to Scotland, and we can’t argue with them, it’s certainly photogenic. Eilean Donan Castle dates from the 13th century, although the original castle was in fact destroyed by British government forces in 1719, and the version that stands today was restored in the early 20th century. Unless you were a castle expert though, you’d be hard pressed to tell that this isn’t a 13th century castle, as the restoration is pretty good! Highlights of a visit include a self-guided tour of the castle, and of course, taking many pictures. There are a few good vantage points, with one of our favourites being from across the water near the town hall, which gives a great view of the castle with the loch in the foreground and the mountains in the background. Like Skye, Eilean Donan is on the west coast of Scotland, meaning that as a day trip it involves a fair bit of driving. As such, we’d again recommend that if you plan on doing this as a day trip, you take a tour. There are two tours we’d suggest you look into. The first is the Isle of Skye tour in our previous entry, which includes a stop at the castle, and sufficient time to allow you to take a tour. The second is a day tour that includes Eilean Donan castle, as well as Applecross and Torridon. This is a stunning part of Scotland that forms a part of the spectacular North Coast 500 driving route, and we think is just as spectacular (if not more so) than Skye itself. To be honest, we think you’ll be happy with both day tours, as long as you are prepared for a fair amount of driving and a long day of adventures. As the largest city in the Scottish Highlands, Inverness has a wide variety of accommodation options across a variety of price points. We have stayed at a number of properties on various trips to Inverness, including a castle hotel, a Scottish mansion, a B&B, an AirBnB flat, and a four star hotel, and have generally been impressed by the variety and quality of accommodation on offer. Here are some ideas for your stay across a variety of budget options. The Kingsmills Hotel – This was the first hotel we stayed at in Inverness, and it is a lovely four star property with its own golf course, about a mile from the city center. You can get a taxi here from the city center, but it has a large free car park on site, making it a good option if you have a car. 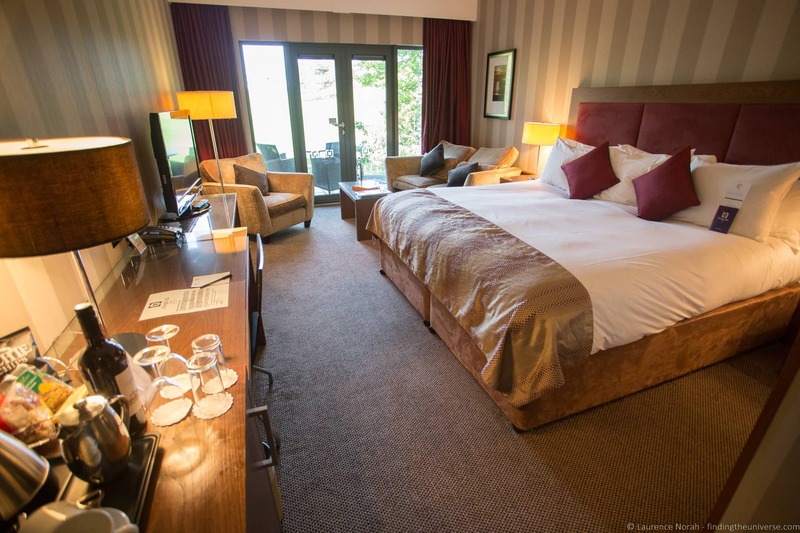 Palace Milton Hotel – This is a very centrally located Best Western which makes for an ideal base for both taking day trips from Inverness, and exploring the city itself. This is a great option if you don’t have a car. No. 55 B&B – We love staying at bed and breakfasts when we travel, and our stay at No.55 was no exception. Friendly owners, good price, an excellent location, and a good breakfast. Another good option for those without a car. Bunchrew House – We spoilt ourselves with a stay at this lovely Scottish mansion house, just a few miles west of Inverness. You’ll want your own car to stay here though. They also serve afternoon tea (can be booked by non-guests). We usually use and recommend Booking.com for accommodation when travelling in the UK, we find they have the best choice of properties, from hotels to apartments, and it’s easy to filter by what you want. See all their listings for Inverness here. If you’d prefer an apartment, and can’t find what you want on booking.com, then our go-to choice is usually AirBnB. They usually have the most choice and a good feedback system helps ensure you get a good quality stay. If you’ve not used them before, you can save up to $100 by signing up through this link. Inverness is well served by transport links from around the UK, with an airport and good rail, bus, and road connections. Inverness Airport is 9 miles outside the city center, and flights operate from various airports in the UK, including London, Edinburgh, and Belfast. International flights also operate from cities including Amsterdam and Dublin. Inverness train station is in the city center, and has connections to Glasgow and Edinburgh, which are around 3.5 hours away, as well as a number of other stations around Scotland and the wider UK. See prices and book train tickets here. You can also catch an overnight sleeper train direct from London, the Caledonian Sleeper, which is one of our favourite ways to travel in the UK. Read our experience taking it from London to Edinburgh here, and check prices and book online here. Finally, Inverness is around a three hour drive from Edinburgh by road, or around a four hour direct bus ride. Bus operators include National Express and Citylink, and you’ll usually get the best prices if you book in advance. For each destination in this post, I’ve shared the various options you have for doing each as a day trip from Inverness. I will summarize them here though for clarity, and then explain which might be best and why. 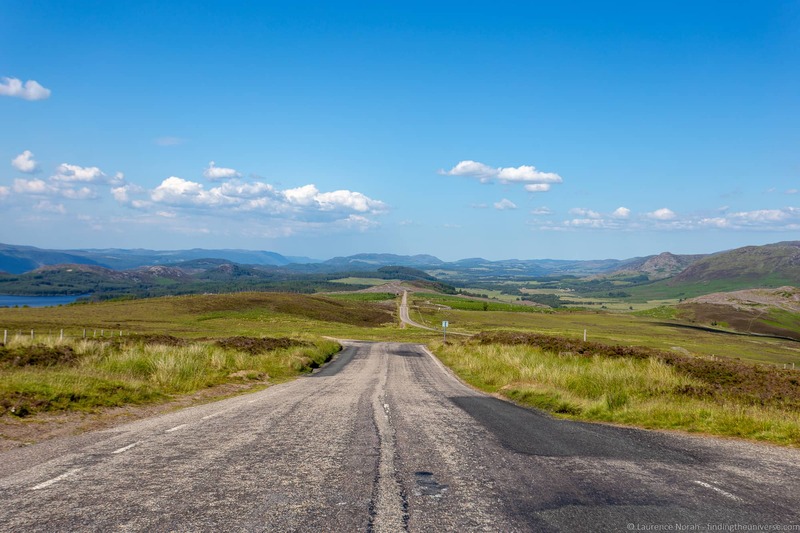 If you live in the UK and have travelled up to Inverness with your own car, then the easiest option for doing these trips is likely going to be to drive yourself. This will give you the greatest flexibility in terms of putting together an itinerary that lets you see everything you want to see. Some destinations we’ve listed are only really practical this way. However, it is worth bearing in mind that there are a few downsides to using a car. First, obviously you won’t get any guided commentary, which is always something we enjoy when we take a tour. Second, you’ll need a designated driver. For tours that include whisky or beer tasting, being the driver will be a real downer as Scottish drink drive laws are very strict (more so than the rest of the UK), and it’s very easy to go over the limit. So in these cases public transport (if available) or a tour might be the best option. If you do decide to visit these locations using a car, depending on where you choose to go you might want to invest in a Historic Scotland Explorer Pass, which will cover your entry to a number of the destination on this list, including Urquhart Castle, Fort George and Elgin Cathedral. For car hire, we recommend you check out both Enterprise and Priceline, and see which has the best offer. For some of the trips we’ve listed, it’s possible to visit the destinations by taking public transport from Inverness. This will work better for tours that are closer to the city, or that feature larger towns, which are more likely to have reliable transport connections. Of course, this will add quite a planning overhead to your trip, as you will have to align your sight-seeing with the bus timetables, which might restrict you. It will also mean you might not be able to see everything you want to see. For public transport in Scotland, take a look at the Traveline Scotland website, which will let you find timetables and routes all around the country. Certainly the least hassle way of taking a day trip from Inverness is to take a guided tour. These are relatively inexpensive for the most part, and take away all the hassle of planning or driving, leaving you to just enjoy the day. Our preferred small group tour operator in Scotland is Rabbie’s. They run small group tours (no more than sixteen people) in nice Mercedes mini-coaches. Their drivers are knowledgeable and fun, and we’ve always had a good time. We’ve taken a lot of their tours in Scotland, including single day trips and longer trips, and have not been disappointed on a tour as yet. In Inverness, tours depart from the central bus station, which right in the middle of Inverness, and also has a great value car-park next door if you want to leave a car here. Of course, Rabbie’s don’t operate tours to absolutely every destination on our list, and we have listed alternative tours in these cases. Tours also don’t run to every destination year round, so do check availability before planning a trip. You can see all their day tours from Inverness here. And that sums up our guide to some of our favourite day trips from Inverness! Before you go, we wanted to share a few of our other guides to help you plan your trip to Scotland and the wider UK, as well as some third party resources we think you’ll find useful. Inverness is the launching point of the famous North Coast 500 – Scotland’s premier driving route. Check out our detailed guide to the North Coast 500 and North Coast 500 Accommodation Guide, as well as my photography highlights on the North Coast 500 for some inspiration for your trip. If you’d like an itinerary for the North Coast 500, check out our detailed 7 Day North Coast 500 camping itinerary. From Inverness you can also head east and tackle the North East 250! This is a newer driving route which covers spectacular scenery, many Speyside distilleries, and the wonderful Moray Firth coastline. See our 3 day NE250 itinerary for advice on that one. If you’re driving in the UK for the first time, check out my tips for driving in the UK for some advice. We also have a guide to how much it costs to travel in the UK. Looking for more inspiration for Scotland? 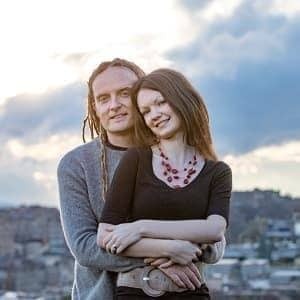 Check out our 2 day Edinburgh itinerary, our Glasgow and Loch Lomond itinerary, our guide to the best day trips from Glasgow, our guide to things to do in Edinburgh, our itinerary for Skye and the Highlands, and our guide to the best day trips from Edinburgh to get you started. We also have a guide to getting from London to Edinburgh. For wider UK trip planning, we have suggested one week and two week UK itineraries as a starter, plus lots more UK content to help you plan your trip. And that’s it! As always, if you have any questions or feedback, just let us know in the comments below!